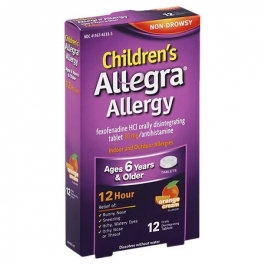 Allegra Children's Allergy gives your child relief from sneezing, runny nose, itchy, watery eyes and itchy nose and throat. It give your child 12 hour relief with each dose. Comes in a delicious berry flavor. Adults and children 12 years of age and over - take two tablets every 12 hours on an empty stomach; do not take more than 4 tablets in 24 hours. Children 6 to under 12 years of age - take one tablet every 12 hours on an empty stomach; do not take more than 2 tablets in 24 hours. Children under 6 years of age - do not use. Adults 65 years of age and older - ask a doctor. Consumers with kidney disease - ask a doctor.